Gelatin is an amazing product...it can be looked upon with disgust when served plainly alongside strange, inedible hospital meals or it can be gobbled up with gusto when combined with a few added ingredients and served with love. Going back farther than the 1930s, gelatin was very popular, especially in the Midwest. In those 'olden' days, many Sunday dinners included a concoction known as golden glow salad...which was orange gelatin infused with grated carrot, canned pineapple and served with mayonnaise. As things progressed in the marketing world, sugar-free gelatin became a staple for dieters. Add a little fruit or vegetables and that gelatin side dish moves over from the junk food column to the real-food column. 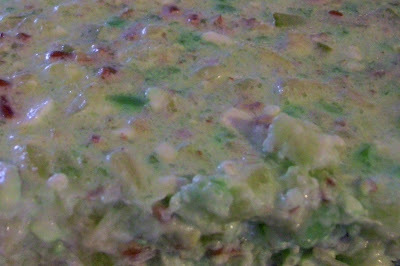 Gelatin desserts or salads are also very economical and, consequently, are often featured at potluck dinners. I usually love those donated salads...partly because I hardly ever think to make them for myself and the flavor combinations others put together are a treat for me. Today's recipe is one that is familiar, easy to make and is tasty...It is a wonder that I had not thought to make it in the past 15 years! Dissolve gelatin in boiling water in a large mixing bowl. Stir until gelatin is dissolved. Chill until partially set. Fold in remaining ingredients and pour into a square glass pan (8x8). Cover with plastic wrap and chill. Slice and serve on lettuce. Marian said: Your recipe sounds good, Diane. I think my mother used to make something similar. One gelatin memory I have is as follows: In 1990 I was in the hospital for nine days with a bleeding ulcer and had just come home. Sister Joan Gale brought me a dish of plain red Jello--nothing else was in it. That tasted so good to me that I ate it for every meal, including breakfast, until it was gone. It just goes to show that embellishments are not necessary, but I may try the salad.